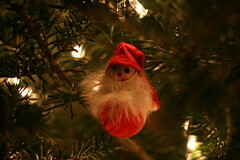 This weekend saw much merrymaking, including a trip to the tree lot to bring home the Best Christmas Tree Ever. He is so cute and just the right size, with no gappy places or wonky branches. He looks so cheery and festive with his ornaments. Bella participated in the tree decorating, in an aloof kind of way. First she was excited to discover stuff piled onto her coffee table, which is normally bare. But she showed no interest in the tree himself, just acting like there was no big green thing in the corner taking attention away from herself. Nothing to see here, because I AM alpha baby, Mr. pokey needle pants, and don't you forget it. After a while she settled down with daddy to watch Baby Dance. Which is fairly unfestive while there is tree decorating, but she seemed satisfied. I also FINALLY got to watch the new Pride and Prejudice this weekend! It was so good. Thank you Margaret for putting up with all of my commentary. Even Bella liked watching it (technically she should have been sleeping). She was in her jump up during the first romantic confession scene and decided to do squeals through the whole thing. That's ok, we have Tivo, I said. (rewind rewind) And she squealed louder the second time. PROVING that she loves the movie! Because don't we all want to squeal when Mr. Darcy says, "All these things I am willing to put aside and ask you to end my agony." !! Not much else is new, except Brent and I have rediscovered the delight of putting alcohol into hot chocolate, and now our evenings are top notch. We are currently using 'dutch cream,' but we've used Bailey's in past years. Any suggestions?